The roasted Hatch green chile and bacon pie I made for KCRW's Good Food pie contest last weekend didn't win. It didn't even make the finals. But it did get me on the radio! Yes, today on Evan Kleiman's Good Food radio show on National Public Radio, during the wrap-up report on the pie contest, you can hear little ol' me talking about my little ol' pies. Producer Harriet Ells gave me a cool digital voice recorder to use while I was baking, and I said all kinds of stupid things that ended up on the virtual cutting room floor. But apparently I also said a few not-as-stupid things that actually sounded like they belonged on NPR and made it through the editing process. Listening to your own voice is weird - do I really sound like that? You'll have to listen and let me know. Listen to the episode online or podcast it on the Good Food website. I have no family traditions involving pie. No one in my family baked pie. The first clear pie memory I have is when I hosted my first Thanksgiving dinner in 1989 or 1990; my parents and grandparents decided to take a cruise over Thanksgiving week, leaving me on my own for the holiday. I invited a few friends and a few friends of said friends, all Thanksgiving orphans like me. I drank a few glasses of wine while getting dinner ready. A friend-of-friends showed up bearing two pies, pumpkin and pecan. I took the pumpkin pie from him, turned around, and promptly dropped it on the floor. Splat. We stared at it for a minute, then got a spoon, piled it back into the (aluminum foil, fortunately) pie plate, and called it "souffle." I no longer drink while cooking. I am still not great with a rolling pin. Thus, both the pies I made for the contest used press-in crusts. I realize that this might have hurt me in the judging. The Hatch green chile pie was really more of a quiche. A darn good pie, and clearly one of the popular favorites at the contest, because it was gone in a flash. But, when it comes right down to it, quiche. Connie Alvarez, one of the Good Food producers, assured me that the judges had liked it and talked about it during their tasting period. But if you listen to the broadcast, you'll hear one of the judges saying: "It's a quiche. Not a pie. A really good quiche, but not a pie." We don't know which entry he was talking about, but I think it must have been this one. Note to self for next year: yes Hatch chiles, yes bacon, no quiche. Quiche or pie, you'll like it, I'm sure. The crust has some masa (corn flour, the kind you use for tortillas) and cornmeal, and I used both panela and cotija cheeses. These Mexican cheeses are easily found in southern California grocery stores and Mexican markets, but if you can't get hold of them, substitute mozzarella for the panela and feta for the cotija, and you'll be just fine. Hatch chiles, for those who haven't heard of them, are the famous New Mexico chiles to which that state bows every fall. Jim, the produce manager at my beloved Bob's Market in Santa Monica, imports a few cases of them every year. They're mostly mild, but occasionally you get one that really wakes you up. I love them. To roast the Hatch chiles, place them over an open flame on a gas stove or directly on the grate of your barbeque. When the skin is blackened on all sides, put the chiles in a bowl covered with plastic wrap and let them steam and cool for about half an hour. Slip off the blackened skins with your fingers, pull out the seeds and ribs, and dice the flesh. And if Hatch chiles aren't available in your area, use any slightly spicy green chile, like Anaheims or even poblanos. Dice the bacon and cook it over medium heat in a skillet until it starts to brown - do not cook it fully. Drain on a plate lined with paper towels. Set aside. Preheat the oven to 400 degrees. Make the crust: In a large bowl, whisk together the flour, masa flour, cornmeal, 1/2 tsp salt, and a pinch of dried chipotle. In a measuring cup, whisk together the olive oil and 1/4 cup of heavy cream. Pour the liquid into the flour mixture and stir with a fork until the dough has just come together. Press the dough over the bottom and up the sides of a large pie plate. The top edge will look a little raggedy; that's fine. Line the pie plate with a piece of foil, covering all the dough, and add some dried peans or pie weights. Bake the crust 15 minutes, then take it out of the oven. Remove the foil and weights. 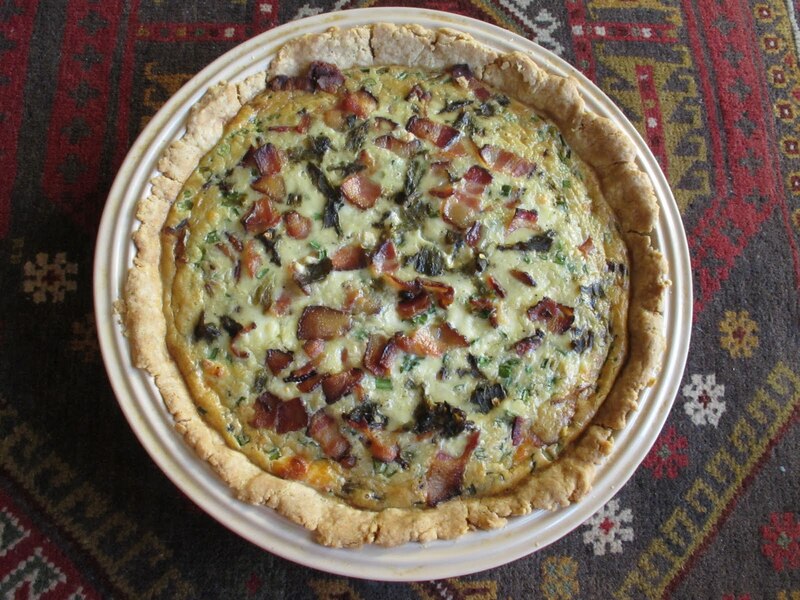 While the crust is in the oven, stir together the remaining 3/4 cup cream, the other pinch of chipotle powder, eggs and yolk, milk, diced roasted Hatch green chiles, green onions, cheeses, and cooked bacon. Pour the mixture into the pre-baked pie crust and place the pie plate on a foil-lined baking sheet - this will keep your oven from getting dirty if the pie happens to bubble over. Bake the pie about 50 minutes, until the center is set and the top is starting to brown. Cool at least one hour before serving. Congratulations! I am such an NPR fan, so I am just thrilled that you were featured on some of their programming. How could you not be though with such a delicious sounding pie? I love hatch green chiles, and I have a ton in my freezer. I want to make this tomorrow! Thanks for sharing! Monet, if you make it, I think you will absolutely love it. Let me know. I'm unclear about the line between pie and quiche, though. What is a custard pie but a sweet quiche? Many pies are single crust, so it's not the lack of a top crust that denotes the difference. What would make it more pie like in the judges' eyes? @FJK - I don't really understand the difference either. But maybe it's about layers. If the chiles and custard had been separated, then definitely not a quiche, right? Lovely recipe, Erika! Congrats on making it to the radio, too! I love Hatch chiles and bought tons this year. Yesterday I made Hatch chile potato salad for the next installment of Summer Fest 2010. By the way, if you don't have an open flame, you can either get a little metal comal and put it on the stovetop or -- what I tried this year -- just put them on a baking sheet and broil them until the skin blisters. Mine are frozen in little bags. Once defrosted, they're easy to peel and seed. Wow, you got prime time, baby! You were the only one interviewed! How'd you score that coup? @Caron - mmm, Hatch green chile potato salad! Can't wait to see that recipe. Was it really spicy? I hate rolling pins too, but I haven't found a press in crust I like. I would recommend getting a French style rolling pin, if you don't have one already, and trying the sour cream crust I posted last summer -- it's very malleable. This looks fantastic, and makes me wish I had more Hatch chiles! @Kate - I will try the sour cream crust - thanks for the suggestion. If you want more Hatch chiles, go to Bob's Market at 17th and Ocean Park. They've got lots.